Ritchey and I standing between the McKee and Ritchey gravestones. Sugar Grove Cemetery, Schuyler County, Illinois, 2002. Today we are leaving Kentucky, heading northwest to Illinois, to the small town of Rushville in Schuyler County. This is the ‘land of the Ritchey’s and McKee’s’ – my Ritchey’s maternal line (he was given his mother’s maiden name at birth). 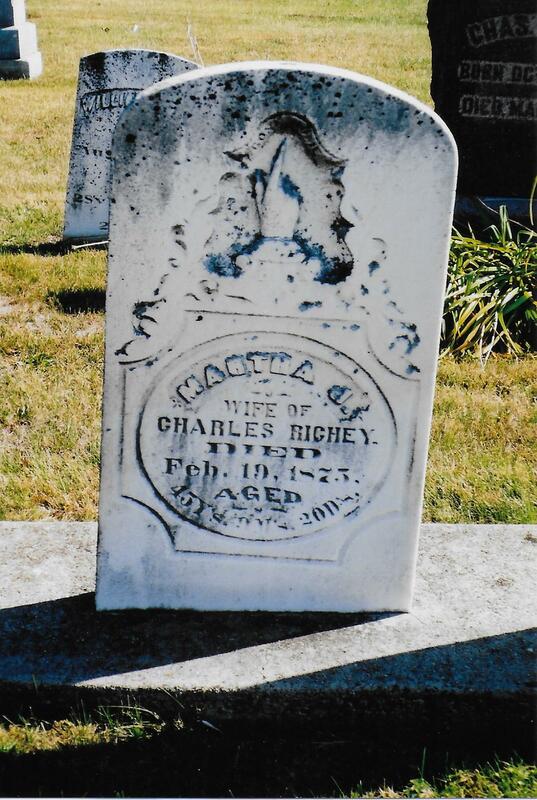 Charles Ritchey is my husband’s gr-gr-grandfather. He was the son of James Ritchey and Susannah Sawyer, born January 22, 1819, in Montgomery County, Ohio. James Ritchey was born in Ireland. Charles Ritchey married Amanda McKee, daughter of William McKee and Cassandra Frakes. Many family members had moved from Indiana, Kentucky, Pennsylvania – making that western trek so popular of that day. In fact, William McKee and James Ritchey were among the first settlers in Schuyler County. Charles and Amanda Ritchey had four sons before her death at the age of 26 – William McKee, James Sylvester, Charles Henry and Jacob. Little Jacob was born and died on April 8, 1851. Amanda followed him to the grave on May 17, 1851, due to problems involving the birth. Martha J., wife of Charles Ritchey, died February 19, 1875, aged 45 years, 9 months and 20 days. Within a few months Charles married again – to Martha J. Walker. Life was not kind to Charles and Martha. They had ten children – six died under the age of three, most living only a few months. John B. Ritchey was 21 when he died and Ida Olive Ritchey was 15. Othello Greene Ritchey died in 1908 at the age of 48. I don’t think he married. Edwin Edward Ritchey died in 1897, age the age of 30, living a widow and two children. 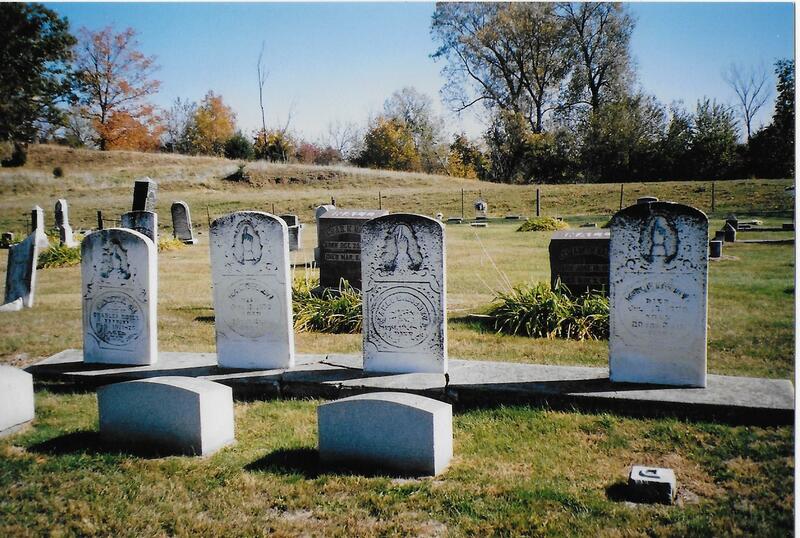 Gravestones, from left, Martha Walker Ritchey, Ida Olive Ritchey, James Sylvester Ritchey, John B. Ritchey. 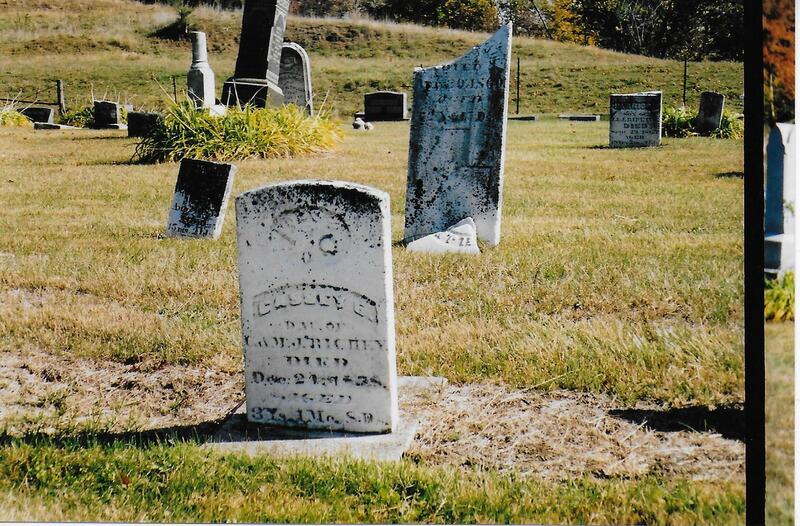 Cassey E., daughter of C & M J Ritchey, died December 24, 1858, 3 years, 1 month, 8 days. 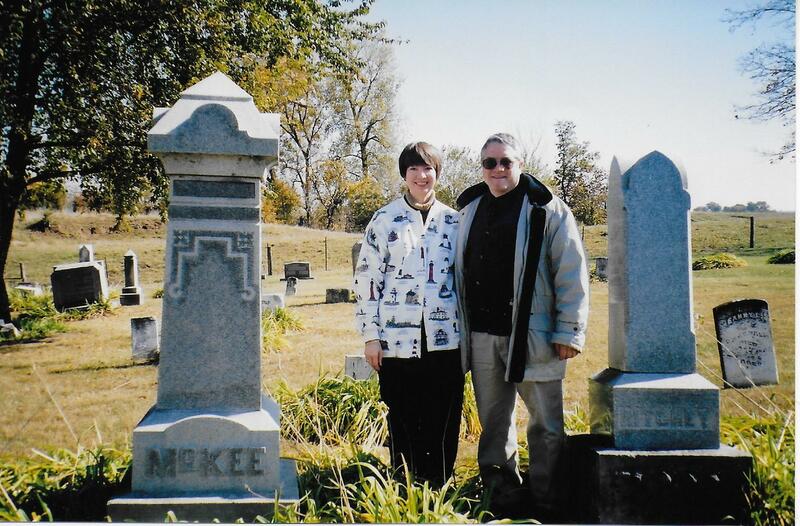 When Ritchey and I visited Sugar Grove Cemetery in Schuyler County, Illinois, in 2002, he was so excited to see the gravestones of his ancestors. Most poignant was the line of stones for the young children of Charles Ritchey. There were no stones for the infants – George F., 1 month; Jacob B., 6 months; Rebecca B., 3 months; Laura, 3 months; and Rachel C., 14 days. 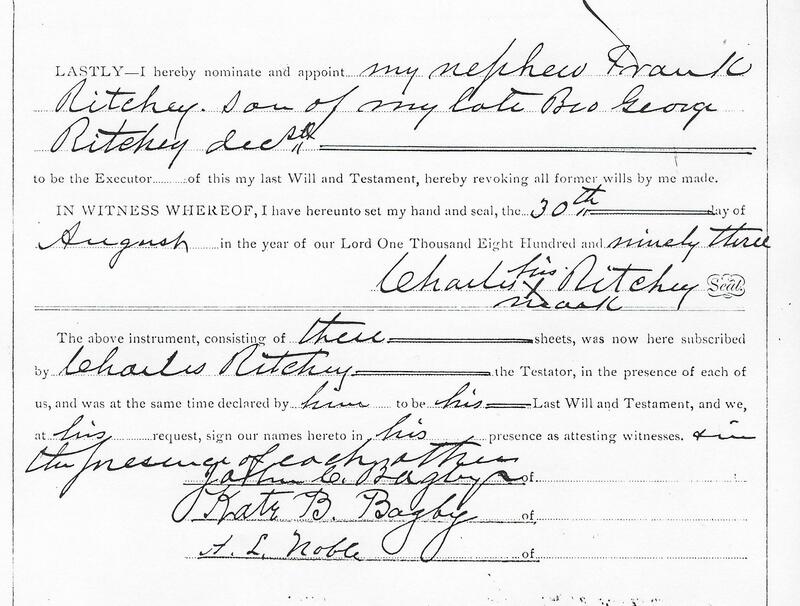 In his will, Charles Ritchey names the five sons that were alive at his death. 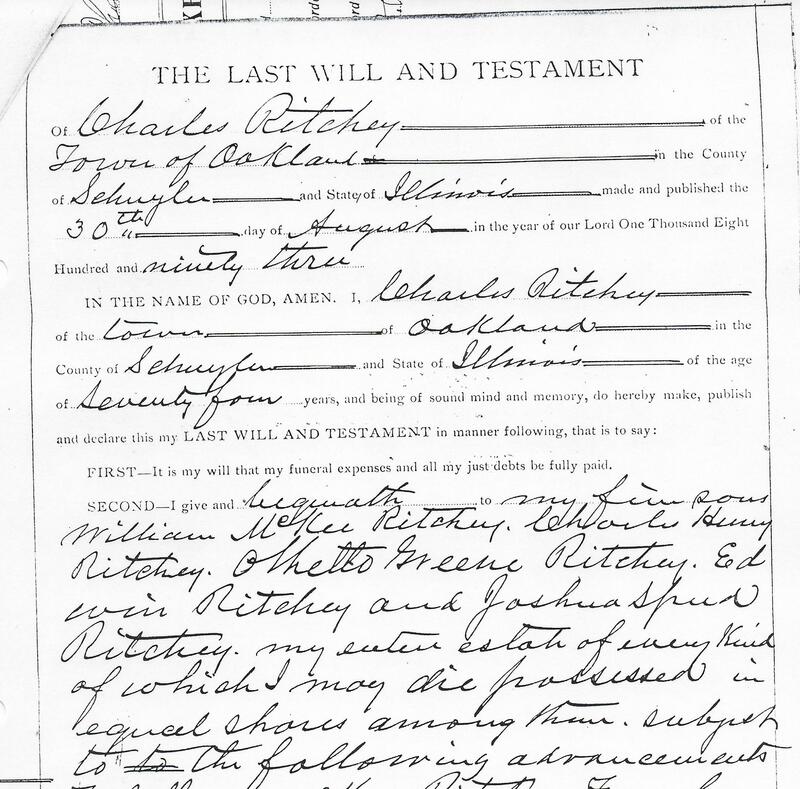 The Last Will and Testament of Charles Ritchey, of the town of Oakland in the County of Schuyler and State of Illinois, made and published the 30th day of August in the year of our Lord one thousand eight hundred and ninety-three. First – It is my will that my funeral expenses and all my just debts be fully paid. Second – I give and bequeath to my five sons, William McKee Ritchey, Charles Henry Ritchey, Othello Greene Ritchey, Edwin Ritchey and Joshua Speed Ritchey, my entire estate of every kind of which I may die possessed, in equal shares among them, subject to the following advancements. 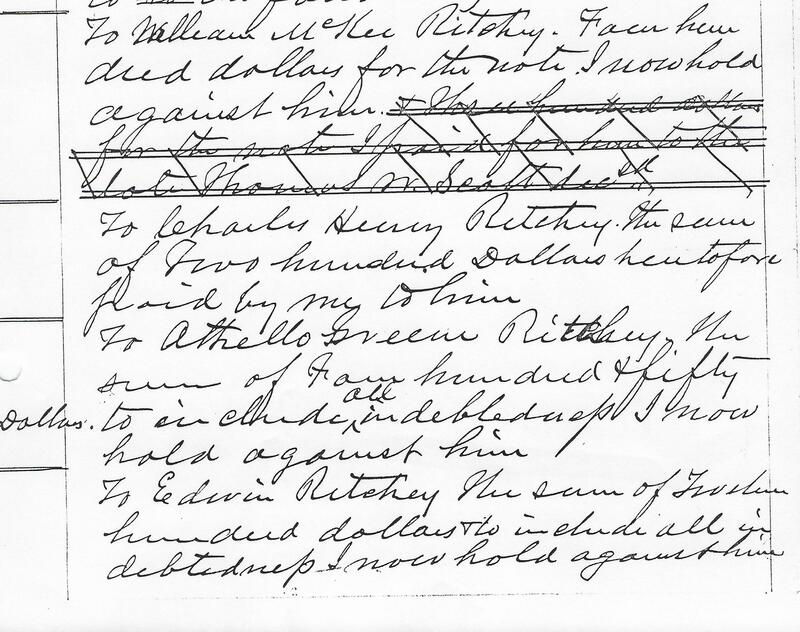 To William McKee Ritchey, four hundred dollars for the note I now hold against him. To Charles Henry Ritchey, the sum of two hundred dollars heretofore paid by me to him. To Othello Greene Ritchey, the sum of four hundred and fifty dollars to include all indebtedness I now hold against him. To Edwin Ritchey, the sum of twelve hundred dollars to include all indebtedness I now hold against him. Joshua Speed Ritchey shall not be charged with any advancement in the settlement of my estate. 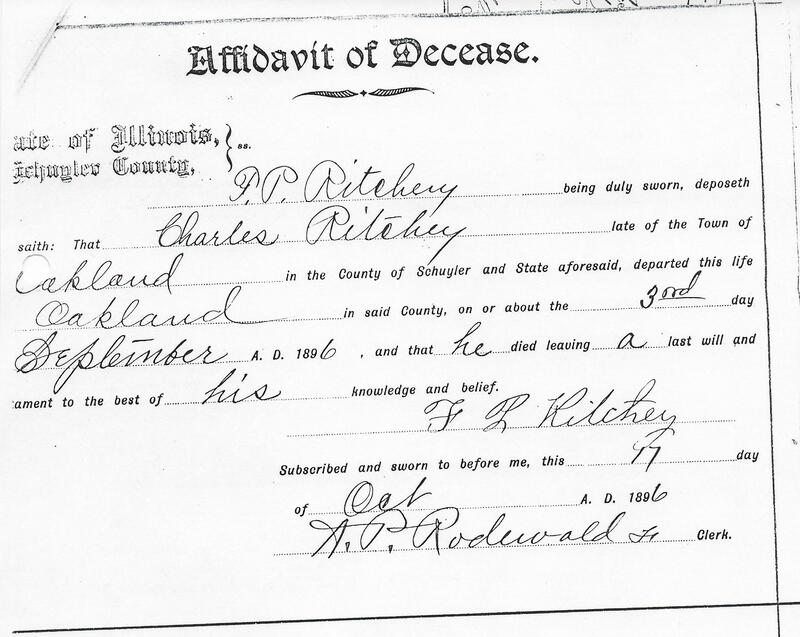 Lastly – I hereby nominate and appoint my nephew, Frank Ritchey, son of my late brother, George Ritchey, deceased, to be Executor of this my last will and testament, hereby revoking all former wills by me made. In witness whereof, I have hereunto set my hand and seal, the 30th day of August, in the year of our lord one thousand eight hundred and ninety-three. The above instrument consisting of three sheets, was now here subscribed by Charles Ritchey, the testator, in the presence of each of us, and was at the same time declared by him to be his last will and testament, and we, at his request, sign our names hereto in his presence as attesting witnesses and in the presence of each other. F. P. Ritchey being duly sworn, deposeth saith: That Charles Ritchey, late of the town of Oakland in the County of Schuyler and State aforesaid, departed this life in Oakland in said County, on or about the 3rd day of September, A.D. 1896, and that he died leaving a last will and testament to the best of his knowledge and belief.